A small town of Pushkin is located at 25 km south of St. Petersburg. 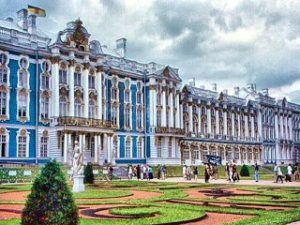 Historically, the estate was called “Saarskaya Myza”, but later, in 1724, when the Russian Empress Catherine I had ordered to built here a palace, and lay a park, it was renamed to “Tsarskoe Selo” (Royal Village). The unique architectural ensemble of Pushkin is world known for its elegant palaces and pavilions, landscape parks and ponds. It has inspired many celebrated Russian poets, painters and musicians to create their masterpieces in music and art. Many world famous and higly-talented russian architects, like Rastrelli, Rinaldi, Cameron, Zemtsov, Chevakinskiy, Neelov were invited to work here, and set here their’s beautiful creations. In 1937 the name of the town was changed to “Pushkin”, in memory of the great Russian poet Alexander Pushkin and his tragic death. The famous amber room is located inside the Catherine’s Palace. It was presented to Peter the Great by the Prussian King Frederick William. The 16-feet panels were constructed of more than 100.000 pieces of amber, perfectly fitted to each other. During the World War II the Nazis dismantled the amber panels and shipped them to Germany, and they have never been found. Many Russians believe that they still exist somewhere in Germany. Russian artists and restorers began to recreate the Amber Room in the the early 1980’s, using the old techniques. The room was finally opened to the public in 2003. The Catherine’s Park is located around the Catherine’s Palace. It combines both a formal garden and a landscape park. The Formal Park, is placed directly behind the Catherine Palace. It was designed by the italian architect Rastrelli. The English landscape Park, which runs to the south of the Cameron Gallery, was laid out by the English architect Johann Busch. This park is centered around the Great Pond and has an extremely varied range of beautiful buildings and monuments. To the west of the Great Pond, there is one more, different area, known as the Italian Park. It also has a number of picturesque buildings.